Over the weekend the Yankees lost out on their most rumored trade target, as the Pirates shipped Gerrit Cole to the Astros for a package most seem to agree is pretty underwhelming. The Yankees were reportedly willing to trade Clint Frazier or Chance Adams for Cole, but not both. They made their very best prospects unavailable. Aside from Cole, the pitcher most connected to the Yankees these last few weeks has been free agent righty Yu Darvish. Darvish confirmed his list is down to six teams and the Yankees are one of the six. And, naturally, as soon as the Cole trade went down, it was speculated the Yankees would move on and sign Darvish. That’s usually how it goes, right? The Yankees missed out on a player they wanted, so they’ll go after the next best thing. There has been a lot — A LOT — of chatter about the Yankees and Darvish the last few days, and it is confusing as hell. It can be tough to tell what is legit and what it nonsense these days. Teams and agents both leak misinformation in an effort to create leverage, and fans eat it up. Let’s try to make sense of all this, shall we? Here’s what we know. On his radio show last Thursday, Michael Kay said the Yankees offered Darvish six years and around $160M, but added the offer was only on the table for 48 hours. That sounds … weird. This is the same Michael Kay who reported Aaron Judge would be named AL MVP, so take this with a big ol’ grain of salt. Now, that said, Darvish eventually confirmed the Yankees did make him an offer. Eventually. First Darvish denied getting an offer from the Yankees, then circled back and said he did, though the numbers (six years and $160M) were incorrect. And then, a few hours later, Bryan Hoch reported that no, the Yankees have not made Darvish an offer. Hmmm. The Yankees are trying to get under the $197M luxury tax threshold, and according to our unofficial calculations, they have about $22M to spend. Realistically, that’s not enough to sign Darvish. The Yankees would have to fit Darvish’s contract under the luxury tax threshold and set aside money for midseason additions and call-ups, nevermind try to find an infielder. Well, duh. That’s what every team is doing right now. Only a handful of the top free agents have signed. It feels like all 30 teams are playing a game of chicken right now. Who’s going to snap first and sign a top tier free agent? That’s where the offseason is at. Every team is waiting (and waiting, and waiting, and waiting) for the prices to drop. It is organic collusion, as Ken Davidoff called it. Anyway, soon after the Cole trade John Harper reported Cashman and the Yankees believe they can land Darvish on a “reasonable” contract. In this case, “reasonable” seems to be Jeff Samardzija money. Two sources on Saturday night said Cashman’s interest in signing Darvish, which he essentially made public during a WFAN interview on Thursday, is very real, largely because he believes this stalled free-agent market gives the Yankees a chance to get the Japanese star pitcher at a “reasonable” price. That might be Darvish’s asking price, but with teams throughout baseball determined to limit the length of long-term contracts, and the righthander coming off that poor World Series performance, the Yankees seem to think it’s possible they could get him for five years, $80-90 million. I’ll take the over on five years and $90M or so, but in this free agent climate, who the hell knows. My guess is the other five teams Darvish is said to be considering would get very involved at five years and $90M-ish. If the price truly falls that far, a) holy crap, and b) it might come down to selling Darvish on the team and city. Cashman and Wolfe talked Darvish, and his camp floated seven years and $160M as contract parameters, which wouldn’t be outrageous for a pitcher of this caliber in a “normal” free agent market. Those numbers trickled down to Kay and, in the game of telephone, it got turned into an actual offer. The Yankees have not made Darvish a formal offer. (I’m sure they’ve talked money.) My hunch is Darvish tweeted the truth when he said the Yankees haven’t made an offer, which sent his agent into damage control mode, hence the correction tweet. Wolfe wants teams thinking the Yankees made an offer. It increases leverage. Because of the luxury tax plan and the hoops the Yankees would have to jump through to fit Darvish under the threshold — they’d have to trade one or more of Brett Gardner, David Robertson, Adam Warren, and Dellin Betances to make it work financially, even at the discounted Samardzija rate (and trading those guys creates another set of problems) — I don’t see them signing him. 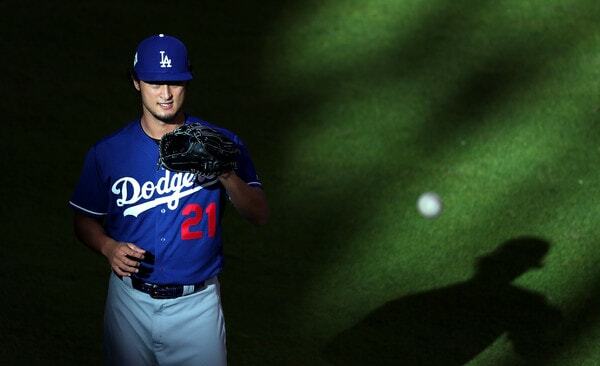 It would be cool if they did sign Darvish. I’m just not counting on it. Over the last month or so the Yankees have been connected primarily to Cole and Darvish, and for a while, it seemed like a Cole trade was inevitable. Eventually the Pirates would cave and take Clint Frazier and whoever else the Yankees deemed expendable. It didn’t happen. The Astros packaged some scraps and got him instead. And as soon as it appeared the Astros would get Cole, the focused immediately shifted to Darvish. That when all this stuff about offers and all that really picked up. The Yankees pretty clearly want to add another starting pitcher. A good one at that. They’d have no trouble finding an affordable depth if that’s what they wanted. They want a difference-maker. That’s why they went after Cole and that’s why Cashman checked in on Darvish. Once you dig through all the nonsense, you end up in a familiar place: The Yankees checked in on Darvish because they check in on everyone, and they’re willing to do a deal at a price that doesn’t blow up the luxury tax plan. So, in that sense, nothing has changed. Via Bill Madden: The Phillies wanted top outfield prospect Aaron Judge in exchange for Marlon Byrd at the trade deadline. The report comes after Phillies GM Ruben Amaro Jr. told Matt Gelb his deadline inactivity was due to other teams not being aggressive enough. Other reports indicate clubs did not believe Philadelphia had sincere interest in moving their players given their unwillingness to negotiate. Judge, 22, is having a monster year after being selected with the second of the Yankees’ three first round picks last summer. He’s hitting .319/.429/.509 (165 wRC+) with 20 doubles, 15 homers, and a system-leading 74 walks in 108 games split between Low-A Charleston and High-A Tampa. Judge for Byrd is silly and the Yankees would never do it, but I don’t think there’s anything wrong with initially asking for a big return. If teams never did that, there wouldn’t be any Scott Kazmir for Victor Zambrano trades. It’s the unwillingness to budge that’s the real problem. For the Phillies, anyway. Don’t be surprised if the Diamondbacks trade right-hander J.J. Putz following their addition of former White Sox closer Addison Reed. Putz is signed for $7 million in 2014, and the D-backs most likely would be required to accept a comparable salary in return. Yankees outfielder Ichiro Suzuki, earning $6.5 million, could be one possibility, though it is not known whether Yankees ownership would part with Suzuki or how he would adjust to a backup role. First things first: that’s not really a rumor. It looks like speculation more than anything. Of course, it also seemed like speculation when Rosenthal said the Phillies could trade Cliff Lee to the Mariners for prospects and then acquire Roy Halladay from the Blue Jays a few years ago, so who knows. (The original Lee-Halladay story seems to be gone, sadly.) The man is well-connected and his speculation tends to be informed speculation, so maybe there are some legs to an Ichiro-Putz swap. The Diamondbacks overhauled their roster this offseason and part of that overhaul included trading for Reed, who figures to take over as closer. Putz was shaky early last season before landing on the DL for two months with an elbow problem in early-May. He never did get his closer’s job back, instead spending the rest of the year in a setup role. Putz, who will turn 37 next month, had a 2.36 ERA (3.83 FIP) in 34.1 innings in 2013. From 2010-2012, he posted a 2.60 ERA (2.48 FIP) in 166.1 innings. He was excellent. Injuries, specifically elbow injuries, have been a big problem for Putz over the years and therein lies the risk. He’s had two elbow surgeries (nerve problem in 2008 and bone chips in 2009) and dealt with various strains and inflammation (2007, 2009, 2011, 2013) throughout his career, so missing time last summer was not exactly a surprise. He’s an even bigger risk now that’s approaching 40, but, when he’s healthy, Putz is pretty good. Certainly better than most of the guys the Yankees currently have lined up for the bullpen. One potential obstacle standing in the way of an Ichiro-Putz trade is Arizona’s outfield depth. They aren’t the only team with a logjam. The D’Backs are currently slated to go into the season with Mark Trumbo in left, A.J. Pollock in center, and Cody Ross in right with Gerardo Parra the heavily used fourth outfielder. Tony Campana, who is very similar to Ichiro at this point, is the fifth outfielder. Maybe they prefer Ichiro’s experience and name value to whatever Campana brings to the table. Ichiro’s role on the Yankees right now is basically pinch-runner and defensive replacement. Not exactly hard to replace. They’ve been shopping him in hopes of saving some money but trading him for a useful (albeit risky) bullpen arm like Putz would be even better. Their contract situations are similar — they’re owed almost identical salaries in 2014 as Rosenthal pointed out, and both guys will become free agents next winter — and the Yankees would take a step towards addressing a pressing need. I don’t really care how the deal would help the D’Backs, to be honest. All I know is if they’re open to dealing Putz for Ichiro, the Yankees should jump all over it. Brian Cashman and Co. have been spending a good deal of time at the local junk yard, searching for scraps that can perhaps fit into their Frankenstein of a 2013 roster. At this point, given the many weaknesses, any available player represents a potential upgrade; even Vernon Wells could prove better than fellow scrap heap additions Ben Francisco and Brennan Boesch. Today a few teams lumped a few more players onto the scrap heap. Looked at from the perspective of the defending AL East champs they normally wouldn’t merit consideration. But with these Yankees, anyone is in play. Lyle Overbay: The Red Sox signed Mike Napoli to play first base, but with the issues they discovered during his physical they sought a MLB-caliber backup plan. That turned out to be Lyle Overbay, whom they signed to a minor league deal in late January. Had he made the Red Sox it would have been his fifth team in the last four years. Today they cut him loose, so he’ll be seeking a different home for that fifth team. With David Ortiz starting the year on the DL, it seemed that Overbay had a chance to make the Sox roster. Apparently they think they can get more out of Mike Carp and perhaps some of their younger players. For his part, Overbay hit well in parts of two seasons with Arizona, but has generally struggled since 2009. He could provide a temporary solution at first base, perhaps platooning with Juan Rivera. Given the Yankees’ vulnerability against left-handed pitching, though, it seems more likely they’ll stick with the right-handed bat. Tyler Greene: If the Astros cut a player, he’s not likely to be of much use to any other team. Ask 30 baseball pundits who will have the No. 1 pick in the 2014 draft and all 30 will guess Houston. Why would the Yankees have any use for a player the Astros couldn’t even use? Because at shortstop the pickings are slim. If Derek Jeter opens the season on the DL, Eduardo Nunez becomes the starting SS with Jayson Nix backing him up. If Nunez’s throwing problems persist and he’s no longer a viable option at SS, Nix isn’t a guy you can really play there every day. That leaves Reegie Corona as the next option on the depth chart. Greene, a 2005 first-round pick, hasn’t hit a lick: .224/.292/.356 in 689 MLB PA. In the minors his only real successes came in the Pacific Coast League, where Bubba Crosby once hit .361/.410/.635. Yet he’s still a likely upgrade over Corona, and gives the Yankees a decent defensive option if Jeter remains immobile and Nunez falters. Ramon Hernandez: He’s not on the scrap heap yet, but it certainly appears he’s headed there. Troy Renck of the Denver Post says that that Hernandez will either be traded or released at some point. He’ll earn $3.2 million this year, and given his abysmal 2012 season, combined with his advanced age, either the Rockies will eat almost all of that in a trade or else be forced to release him. The Yankees seem committed to Francisco Cervelli to start the season. The disdain for Cervelli is a bit over the top in my opinion, seeing as he does own a career .271/.339/.353 line in about a full season’s worth of PA. Still, that’s spread out pretty far so the Yankees could use a backup plan. Austin Romine will likely need some more time, and Chris Stewart is hardly an option to start. Hernandez was worse last year, but he also suffered from a hand injury. At 37, though, he’s quite a risk. The Yanks might rather go with who they have in camp already than an unknown outsider. In normal years, we might have laughed off these players. Who needs these old, underperforming players? But with injuries and general lack of depth this year, everyone becomes an option. At this point it would be something of a surprise if the Yankees didn’t sign one of these three players.